Now before you get too excited about the Sexi neighborhoods, let us tell you a little about where the term comes from. Almuñécar began as a Phoenician colony named Sexi, and even today, some of its inhabitants still call themselves Sexitanos. The Phoenicians first established the colony in about 800 BC and this developed for six hundred years into an important port and town with the name of Ex or Sexi. With a large fish salting and curing industry which was a major supplier to Greece and Rome. They also supplied a prized fish paste called garum made from the intestines of small fishes by a process of fermentation. The town of Almuñécar is flanked with 2 high hills (Los Pinos and Paseo de Cotobro) and one small hill in the center (Old Town / San Miguel). La Herradura is also flanked with 2 high hills (Punta Mona and Cerro Gordo). Between Almuñécar and La Herradura is a hillside residential area named Cotobro. Below we will review some of the Neighborhoods of Almuñécar moving from the East side of town to La Herradura. Feel free to click on the map to view a larger version. 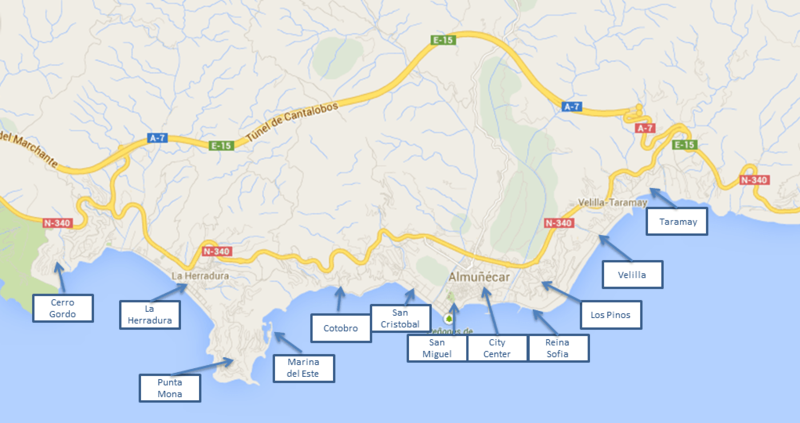 Please review the Almuñécar town map to see the proximity of shops, schools and services. Proximity to town – You can walk to town (40-45 min), but it would either be over or around the hill. There is a bus line that will take you to town and it is 1€ for the ride. Almuñécar city bus schedule. Activity – This area is very lively in the summer months and very quiet and calm in the winter months. Location – Many town homes and apartments built into the hillside. Along the beach area are a few restaurants, which are seasonal. Those in Tesorillo Beach are usually open all year. This area is near Pozuelo Beach and Tesorillo Beach. Proximity to town – You can walk to town (15-45 min), depending on which end of the beach you are on. It would either be over or around the hill. There is a bus line that will take you to town and it is 1€ for the ride. Almuñécar city bus schedule. Activity – This area is very lively in the summer months and almost a ghost town in the winter months. Location – This is a strip of high-rise condos/apartments along the beach. There are many restaurants and a few shops, which are mainly seasonal. Of course this is on the beach, Playa Velilla. Proximity to town – You can walk to town (10-15 min) along the beach. The Aqua Park is just at the tip of the point between Velilla and Paseo Reina Sofia. Driving – There is a radar speed check on this stretch of the road by the police, so go the speed limit. Location – This is a small strip of high-rise condos/apartments along the beach, with a couple of restaurants, which are seasonal. Proximity to town – You can walk to town (10-25 min down), but this area is on the hillside. Depending on which level you are located, it can be a long hike back up. This is the hill that sits above Velilla and Reina Sofia. Activity – This area is very quiet and residential, also home to the International School. Location – This is a residential area of villas, terraced apartments and condos. There is actually an urbanization named Los Pinos, thus people refer to this area as such. All shops and goods are located in town. Proximity to town – This is town! Activity – It is active all year, full of shops, banks, restaurants, markets, old town, central bus station, a few small grocery stores a few schools and much more. Location – This area is a mix residential and commercial. It feels like a small city with a few main streets for vehicles, a pedestrian only center with plazas and outdoor cafes. This is where the action is. The main beach is Playa Puerta del Mar and it is full of activity, events and people. Proximity to town – This is town! San Miguel is the original town and set atop a small hill. This is predominantly pedestrian only zone, with limited access via car/scooter for residents only. Activity – It is active all year. Location – This area is very residential and above the center of town with all of the shops. You may find a little kiosk on the hill selling snacks, but all shopping is really at the bottom of the hill. The Castle and Museum are located atop this hill. You can pretty much easily access any part of town, just go down the hill on different sides to access the town center, Puerta del Mar, San Cristobal or Avenida Europa. Proximity to town – You can easily walk to town (5-20 min). It depends which end of the beach. There is a bus line that will take you to town and it is 1€ for the ride. Almuñécar city bus schedule. Activity – This area active all year-long and busy with water activities in the summer. It is more active along the beach and the promenade, with outdoor cafes. Location – This area is a combination of residential, tourist shops, hotels and restaurants. The big Mercadona and the public swimming pool are both located just a block inland from the beach, just over the river. The residential area near La Noria is also set back from the beach. The main tourist office is located in this area and it is just below the castle and San Miguel area. The end of this beach area is the hillside above Paseo de Cotobro. With many terraced homes and villas. The main beach in this area is of course Playa San Cristobal. Proximity to town – You can walk to town (25-35 min) along the beach. There is a bus line that will take you to town and it is 1€ for the ride. Almuñécar city bus schedule. Activity – This area is very quiet most of the year. There is more activity on the beach in the summer months and provide foot access to Playa Muro, which is the naturist beach. Location – This area is built into the hillside so many great sea views, with mainly villas and some beach front condos. There is one small hotel and there are 2 restaurants. The Cotobro beach has one small boat launch and is very cozy. Proximity to town – You would need transportation into town or the local bus. There is a bus line that will take you to town and it is 1€ for the ride. Almuñécar city bus schedule. Activity – This area is very quiet most of the year. There is more activity in the summer months. Location – Mainly villas and terraced homes/apartments. There is a marina and one small hotel and restaurant. This area is built into the hillside so many great sea views. This sits below Punta Mona. Proximity to town – You would need transportation into town (La Herradura or Almuñécar ) or the local bus. You can walk on hiking trail or on roads through Cotobro. It is about a 60-90 min walk to Almuñécar and 15-25 min walk to La Herradura. Activity – This area is very quiet most of the year. There is more activity in the summer months. Popular for paragliding take off points. Location – This is a residential area on the hills between Cotobro and La Herradurra. Mainly villas and some terraced homes/apartments. This area is built into the hillside so many great sea views. Proximity to town – This is its own small pueblo. You would need transportation into town or there is a bus line going to/from Almuñécar . The bus is 1€ for the ride. Almuñécar city bus schedule. Activity – This area is active in the summer with water activities and fairly quiet in the winter months. There are shops and restaurants open all year and a small daily market in the center. The beach is a popular for paragliding landings. Location – This is a small town at the west end of Almuñécar. It is a town of its own, but does utilize the town hall services of Almuñécar. There is a mix of villas, apartments, condos and some terraced homes/apartments. In this area, there is one primary school and one secondary school, through 10th grade. There are a couple “supermercados” and one Dia% located here, but for the big grocery store or market you would need to go to Almuñécar. You are of course on La Herradura Beach and at either end you will find some interesting snorkeling spots. Proximity to town – You would need transportation into town (La Herradura or Almuñécar ). Activity – This area is very quiet most of the year. There is a little more activity in the summer months, but almost a ghost town in the winter. Location – This is a residential area on the hills by the national park at the west end of La Herradura. Mainly terraced homes/apartments. This area is built into the hillside so many great sea views. Need any products for your home?